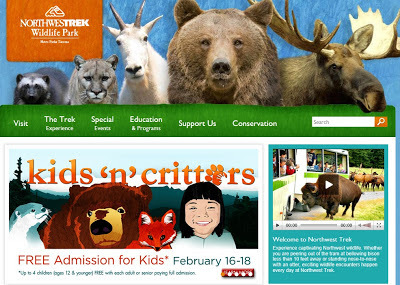 Sisters with Stuff: Free admission for Kids to NW Trek Wildlife Park this weekend! Free admission for Kids to NW Trek Wildlife Park this weekend! FREE Admission for Kids February 16-18 (kids 12 & younger) up to 4 free per paying adult. For all the details go to www.nwtrek.org! 1SaleaDay Selloff new Deal every 30 minutes! You can never have enough cereal coupons! Charlotte's Web DVD only $3.99! HOT HOT!! High value Fisher Price coupons! $10 off at thredUp! Almost new kids clothing! Energy Meter $19.99 and FREE Shipping! File your Taxes for FREE with TurboTax! Some tips to protect your Cast Iron! $7.99 For 2 Years of Elle Magazine! Check out your local Thriftstores this weekend! Have you signed up for Ibotta yet? File your Federal Taxes for FREE! Make your own coffee scented air freshener! FREE Digital issue to Midwest Living Magazine! Love Target? Sign up for coupons and deals! Try this for your get together!